Raugust Communications publishes books and reports on the licensing business, written by Karen Raugust. Titles include research reports, how-to topics, and licensing trends and issues; the focus is on filling the white space in the market for licensing information by addressing topics not covered in depth by other resources. To purchase, just click on the “Buy” buttons at the end of each description. In the context of today’s ever-evolving licensing landscape, how can members of the licensing community position themselves for continued success? 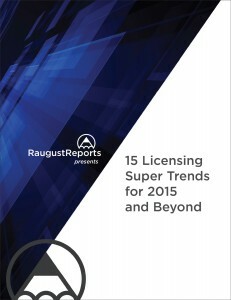 RaugustReports Presents: 15 Licensing Super Trends for 2015 and Beyond examines 15 overriding trends that will endure for the foreseeable future, as well as 70 shorter-term developments that reflect and support the super trends. Authored by Karen Raugust, the report offers a snapshot of the licensing business as it stands in early 2015, and serves as a blueprint to help guide licensing executives as they face the future. You will receive the PDF via email with 24 hours. The Licensing Business Handbook is the original and best-reviewed how-to book on the ins and outs of licensing. After taking over publishing rights from the former distributor, Raugust Communications plans to release an all-new 9th edition later this year. If you need a copy of the 8th edition in the meantime, it is available here (PDF only). The new revision of the Handbook—which celebrated its 20th anniversary in 2015—will feature substantial changes to reflect the evolution of the licensing business since the first edition in 1995. It will continue to guide licensors, licensees, licensing agents, and other licensing participants step-by-step through the licensing process from beginning to end, providing detailed information on payment structures, contracts, intellectual property protection, strategic considerations, and much more. The Licensing Business Handbook, by Karen Raugust, has long served as a valuable reference for novices and experts alike, as a textbook for licensing courses, and as an introduction to licensing for new employees or top management. Karen Raugust will be moderating “Crowdfunding to Launch a Product or Property,” a Licensing University session at Licensing Expo 2019. The presentation, on Tuesday, June 4, from 4 p.m. to 5 p.m., will explain how crowdfunding works, provide data on how licensors and licensees are currently using this technique, and discuss some key challenges and how to overcome them. Jerry Bennington, vice president of new product development at IDW Publishing, and Abigail Edgecliffe-Johnson, entrepreneur and founder of RaceYa, will join Karen on the panel. Licensing University is part of Licensing Expo, held June 4 to 6, 2019, at Mandalay Bay in Las Vegas. If you’re interested in some of the licensing trends noted at the 2019 edition of the New York Toy Fair, you can read RaugustReports’ summary here. Topics covered include new twists on old trends, a dearth of entertainment/character licensing, the continued rise and impact of YouTube-rooted properties, and a back-to-basics sensibility that helps provide a counterbalance to kids’ digital lives. Enter your email address to subscribe at no cost to RaugustReports—twice-weekly insights on the licensing trends you need to know—and receive notifications of new posts by email. Sign up for our free monthly enewsletter to receive the Licensing Trend of the Month—exclusive to the newsletter—and the latest from Raugust Communications.